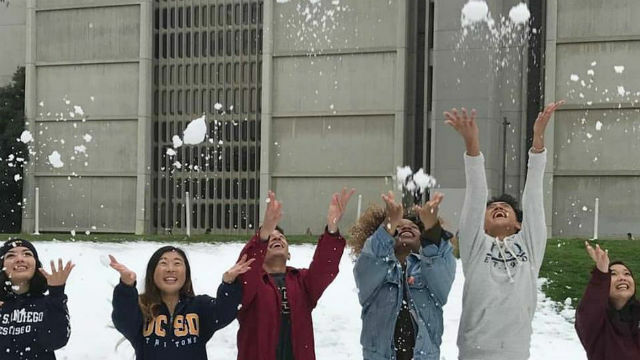 UC San Diego students marked the 50th anniversary of Muir College with a “snow day” Tuesday on Sun God lawn. It was man-made snow, but it’s a recognition of the day it snowed on the campus in December 1967, the year the college was founded in honor of naturalist John Muir. According to AccuWeather, a powerful Pacific storm left enough snow on the ground 50 years ago to build snowmen in many parts of the San Diego. To let students unwind the week before finals, the memory of the snowy day was revived. Students thew snowballs and sampled hot cocoa until noon.